On December 26, 2003, I sent a request to the Limerick Archives for baptismal records for the Brown family. In just over a week I had a response and what information was contained in the response! I felt like I had really hit the jackpot so the amount I paid for the records, which really was not very much, was worth every penny. The records were found in Patrickswell Roman Catholic Church. Yes, this really is our family despite the discrepancy in the mother’s name – Hannah vs. Johanna (the church records also show Honora). Not all of the information agreed with the information in the David Brown letter, but the differences were very few. (See the response from the Limerick Archives at the left. 1) The siblings are listed in the same order with two exceptions. There is an additional child, David, between Patrick and John that had not previously been identified. Since I have not found information on him in America with the rest of the children, it is assumed that he died sometime between his baptism in 1832 and the date the family arrived in America. Moreover, it seems that “David” is an important name in the family since that name tends to be repeated in several generations. The other difference is the absence of a record on James. The Limerick Archives letter gives a possible explanation that children who were not thriving at birth may have been baptized at home and not recorded in the church records. 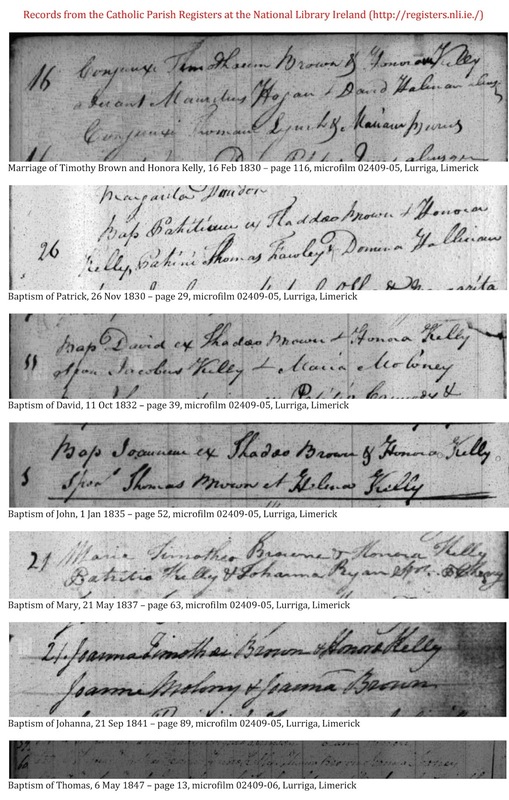 When I found the actual records in the Patrickswell church records, there appears to be a few discrepancies in the abstracts from the Limerick Archives. The most obvious is that the marriage of Timothy Brown and Honora Kelley took place in 1830, not 1930 as identified in the archives letter. Another difference is that the month of David’s baptism is actually October, not January. 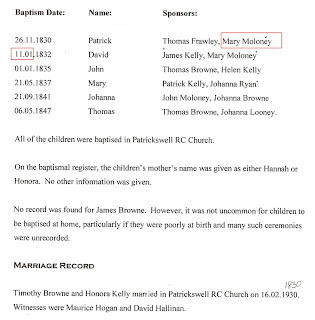 Also, the second sponsor at the baptism of Patrick appears to be Domina Hallinan and not Mary Moloney. (See copies of the baptismal records at the right.3) Note the sponsors for the marriage and baptismal records. These become particularly important in future research. 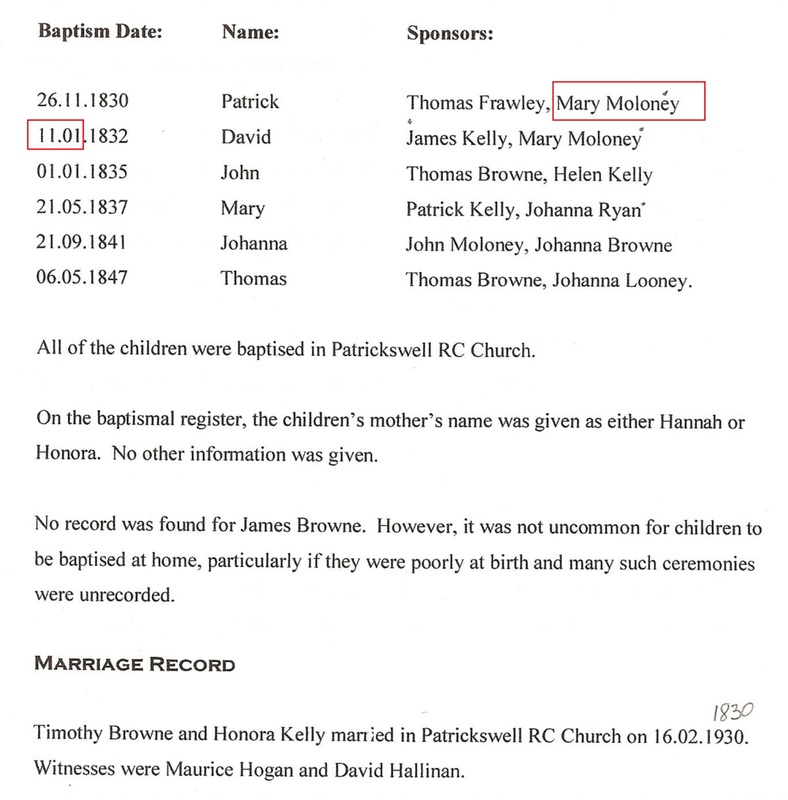 The letter goes on to state that the names of the parents of Timothy Browne and Hannah Kelley are not known since there are no baptismal records for them but that, at least, Hannah likely came from Patrickswell since marriages usually took place in the bride’s parish. The other missing piece of information was the actual address of the family in Patrickswell. Patrickswell is the name of the church parish. In Ireland, there are church parishes and civil parishes which are not the same when looking for geographic locations. There is also a village of Patrickswell which is located about 10 miles southwest of the city of Limerick. We were planning a trip to Ireland in 2005 and wanted to find the homeland and needed a more precise location, specifically the townland, within the civil parish. A New Genealogical Atlas of Ireland, a book by Brian Mitchell4, gives a cross reference of church parish to civil parish. The maps for the area are very small and Patrickswell could be in the civil parish of Adare or the surrounding parishes. How I determined the townland will be the subject of the next post. 3. 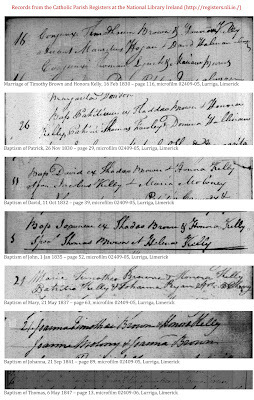 Patrickswell Catholic Parish registers at the National Library Ireland. Page numbers refer to the online records at http://registers.nli.ie/. But really, where in County Limerick?